So in my last post I fessed up to being on the hunt for some dresses for the summer & one dress that appeals as much as a stripy number is a cream lacy, floaty kind of dress too. I blame this on the cool effortless looks I always see around at this time of year & also on the fact that if we're lucky to see some more sun then with my skin hopefully becoming sun kissed (or fake-kissed if not!!) it's a look I can just about get away with without looking like death warmed up!!! Now there seems to be some stunning numbers around this season with a lot of the ones that have caught my eye being from Mango & ASOS. So without further ado let's get cracking. First up is this polka dot flared dress, perfect for sunny balmy days (oh just the thought of some more sunshine makes me sigh with happiness!) & dressing down with some simple flats but it would also look equally stunning teamed with a denim jacket & ankle boots on cooler days too. Next up is this stunning dress also from Mango that may have 'somehow' found it's way to me after seeing it look so stunning on Michelle of My Fashionable 40s & Annmarie of Fashion Mum of 40 - girls I'm blaming this one on you ;-) !!!! 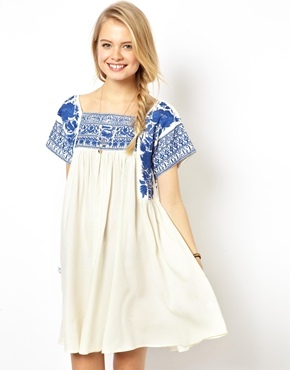 This next one from ASOS is very similar to the Mango one & the blue embroidery is just stunning - perfect for lazy days in the Med (or indeed the UK if the heatwave resumes! ), team with a simple panama & simple flat tan sandals for an effortless cool look no matter what the temperature. 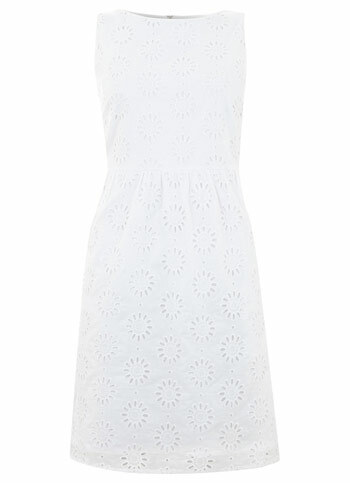 If you prefer something a little more tailored then how about this shift dress also from ASOS. Perfect for teaming with flats or wedges & would look fab teamed with a navy blazer for cooler days or a pashmina & fascinator for a summer wedding....that's if you're happy to wear cream to a wedding of course - now that's a debate that could run for hours isn't it?!!! Of a similar design but at under half the price this one from New Look may well be worth a peak. 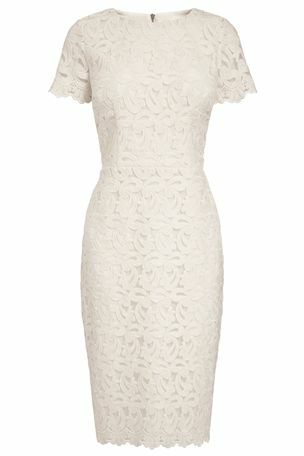 Totally love this smock lace dress from ASOS, so, so very pretty & ideal for dressing up or down whatever the occasion. 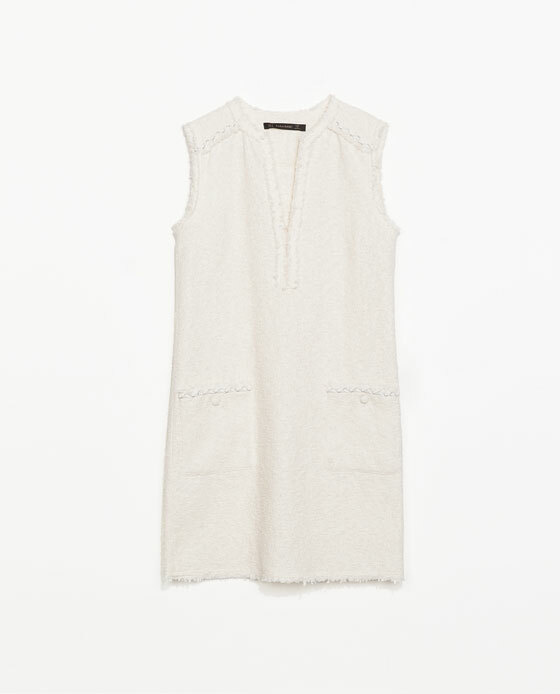 If you however, fancy a dress for cooler summer days then what about this one from Ganni - I just love this & reckon it would look pretty fab in the autumn winter too with black opaques, ankle boots & a black blazer. Okay so this next dress isn't cream but I love this whtie brodrais sundress from Mint Velvet another great colour combo for teaming with a tan & a denim jacket, not to mention tan accessories & again great for dressing down or up depending on the occasion. Now we all know I have a huge weakness for boucle & this next dress has me going weak at the knees & will definitely be being ordered for a trying on session!!! Moving onto a Victoria Beckham kind of theme with this peplum hem textured dress from ASOS, I absolutely love this & such a flattering style too. Plus it comes in this stunning shade of yellow, which I just had to share with you - how gorgeous would this look with navy accessories for a summer wedding?!!! More of a structured dress with this next one from Next - great for a special occasion or even wearing to the office when teamed with a blazer. I also had to include this Next dress that I purchased a couple of months ago in today's post, a great casual number for use on gloriously hot days & perfect for a beach cover up too. I'm hoping this teamed with a panama hat will help me try to achieve the effortlessly chic look everyone else seems to master on holiday whilst I just look all frizzy haired & hot!!!! 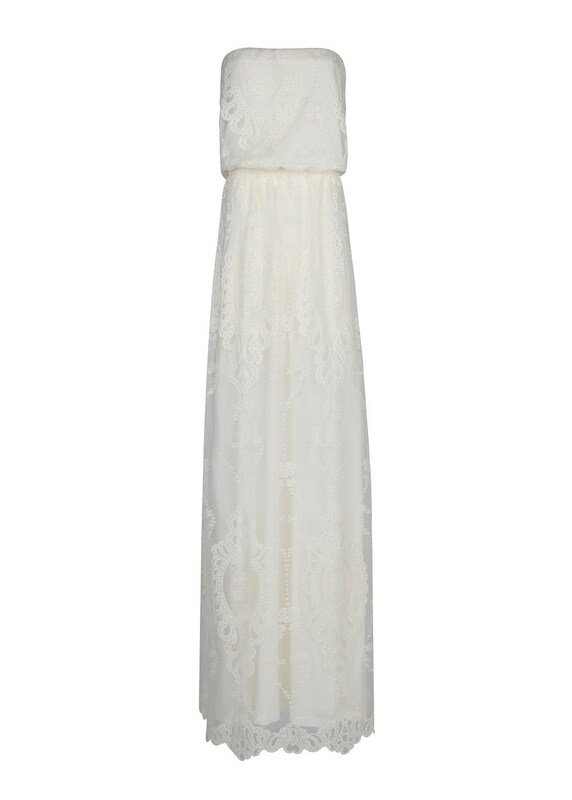 Moving onto maxi dresses now & back to Mango for this embroidered maxi, which is simply just stunning. Although if I'm honest it would be a close call between this & the next lace one from Mango, I love both so much!!!! And stepping away from all things cream & lacy & back to my outfit for today. Wearing my grey Mango jacket with my combats & a statement scarf....although the weather is looking quite promising so I'm hoping the jacket will be discarded before too long!!! So what do you think are you feeling the love for all things cream & floaty & like me on the hunt for the perfect dress or two? Or perhaps you've already got your perfect dress tucked away in the wardrobe & are waiting for scorching sun & sun kissed limbs before bringing it out to play? Have a great hump day......not long till the weekend & it's a Bank Holiday one too!!! Thanks Helen, I don't think I've ever seen you in a dress or a skirt come to think of it!! Some good ideas there - fingers crossed the warm, sunny weather reappears after the Bank Holiday - rain forecast and dull most of it. Nooooo it can't rain for Bank Holiday :-( we were thinking of sneaking a day by the sea.....oh well we'll just have to settle for a day in front of the fire! Aww Michelle you're more than welcome & it's down to you & Annmarie that I clicked the button!!! I've also got my eye on another Mango dress, I wonder if we're thinking of the same one?!!! Some lovely dresses but also some perhaps a little young for someone at the midlife stage. Some lovely dresses there Jane. I also ordered the Mango dress which AnneMarie and Michelle have but returned mine - it was nice on me but not as nice as on the other girls. I am so going to regret it when I see you all marching around in yours this summer. Maybe I need to hit that button again! Thanks Sharron & yes I think there's now limited availability on the ASOS one, although I'm not surprised as it's gorgeous. Thanks Porcelina you can't beat a white dress, sunshine & sun kissed skin can you?!! Some great pics Jane, that yellow asos one has my name all over it. Totally loving your outfits very stylish yet casual and comfy looking! Trea I thought of you as soon as I saw that dress in yellow lol! !